Director On Call — Funeral Business Advisor: McCaw Funeral Service Ltd.
Funeral Business Advisor: McCaw Funeral Service Ltd.
"In keeping with modern technology, they also use the services of Director on Call. Joel’s father, Dale first reached out to them because he saw a need for their service. Joel recalls, 'For him, it just got to the point where these services were available, like call-forwarding, etc. and he felt confident in giving them the responsibility of answering that first call.' Joel went on to say, 'For myself now, I couldn’t imagine not having them be part of our business. We can rely on them to answer our phones at any given time and effectively transmit the information to us making it that much easier for us to help our families like we have for the past 60 years.'" McCaw Funeral Service has over a half century of service and commitment to Lloydminster and the greater Midwest community. 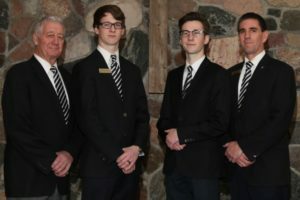 Their business was started by the patriarch of their family, Meredith (Mert) McCaw in May of 1948 when he moved to Turtleford, Saskatchewan and purchased the existing funeral service firm from undertakers – Jim Ripley of Mervin, Saskatchewan and Adolf Adams of Maidstone, Saskatchewan. Together, Mert and his wife Helen served the towns and surrounding communities of Marshall, Maidstone, Paynton, and the Turtleford-Edam areas for ten years. Today, McCaw Funeral Service still maintains a sub-office in Turtleford, Saskatchewan. In 1958, Mert and Helen moved to Lloydminster, Saskatchewan to establish a new funeral home. Tragically, Mert died a year later in a motor vehicle accident and Helen was left to operate the business until she sold it to Mert’s brother, Dave, in 1964. Joel’s father Dale, along with his uncle Glenn picked up the family torch in their family’s commitment to service. Dale McCaw was a partner and funeral director from 1986 until his tragic death in a motor vehicle accident in 2009. Dale’s son, Joel, joined the family business full-time that same year. Two years later, Dale’s second son, Brett also joined the family business. The McCaw’s passion for serving continues today with Joel and Brett McCaw leading the way. “I think for me the loss of my father to a certain extent, started my journey into total commitment to funeral service. I guess too, when we had my father’s service here, I experienced community support for us. I know we are a continuation of our community here. We very much consider our family being part of their families and we are very fortunate to be able to continue on with what our family started before us,” Joel said. Their use of technology is helping them to bridge the gap between the older generation and the younger generation. They have a very comprehensive website that is easily navigated by all people that need their help. “Our website is something we feel is very closely tied to our day-to-day operations. Our community is commenting that they see our faces every day, know what is going on, who has recently passed away by visiting our website. This is how information is received and transmitted these days so we make sure we have the technology that people are able to find the information they need, even making pre-arrangements online. We find there are more and more families that don’t necessarily have the time to come in and sit with us, but have the time to email us their forms and that gives us a starting point to help them and figure out what is the next step for them. They have recently partnered with Funeral Tech to redesign their website and also to integrate all their different aspects of their site and social media. “By having this technology in place, it gives us more time to be with our families and spend time in our community which is our key thing to do,” said Joel. Their success also comes from their continuing care and service to their families through their aftercare programs. They follow-up with all of their families with heart-felt cards and hold an annual Christmas Candlelight service for the community. All are invited that have lost a loved one over the past year. “We have received very positive feedback about this service and are happy to provide it for our community. We want all people to have connections with their community and other families that are going through the same experiences,” said Joel. The McCaws have built a fine reputation and are successful due to their passion for their families and community. “It’s a key part of what we do and why we feel so passionately about what we do. We firmly believe that what we do fulfills a need in society. Society needs a way to observe a person’s passing, honor a life and give the community support for their loved ones they care so much about and that understanding is what we have always worked from,” stated Joel humbly.